For those of you who have teenagers, you will get this. Our household has entered the world of video games in the last year. And while I don’t “understand” how someone can sit for that long and play something, as I started thinking about it, the draw to continue to play a video game is a little like our constant journey to success. I’ll get back to that in a moment, let’s talk about the definition of success first. There are so many resources that will coach you and help you along the journey to success, but where all of them miss the mark is actually defining success. 1.the favorable or prosperous termination of attempts or endeavors; the accomplishment of one’s goals. The attainment or accomplishment of something defines success. But the issue here is there is no actual universal definition of success. Success for my teenager is getting to the next level in the game, or maybe ultimate success is beating the game. 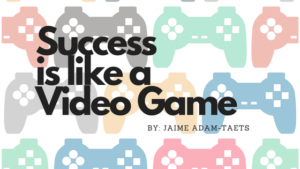 Success for someone just learning to play video games, might be to get past the first level. Success for someone graduating college might be to get a good job to pay off their student debt. I could go on the on. Each of us has a different definition of success, and that definition continues to change and evolve as we change and our circumstances change. Where this becomes an issue is that we spend time looking at other people’s successes and believing that if we achieve what they have achieved, we will be successful. I coach people that chasing someone else’s idea of success will actually lead you directly to failure – over and over again. Rather, I recommend that you define success for yourself – personally, professionally, physically, emotionally, whatever goals you have in different areas of your life. And break those goals down into bite-sized accomplishments that you can achieve, celebrate and continue the climb with energy. When we look elsewhere for a definition of success, we immediately set ourselves up for failure. A key success factor to achieving your goals is to hire a coach or find an accountability partner that can push you and make sure you are writing your own definition of success. This person will help you stay accountable to getting to the next “level” in your own video game of life. Remember that you are not on this journey alone, and having help along the way will decrease the time it takes you to achieve your goals and will always push you further than you will push yourself.